I got inspired over the weekend, and turned an old project of mine – a Special Report called “Why Women Play Dirty” – into an eBook AND sent it to print with CreateSpace (Amazon Publishing). WOW! It’s a short guide to how women compete, from an evolutionary, psychological and sociological perspective (written in a fun, very casual style), and how a woman can protect herself while dealing with female rivalry at work. I can’t wait to hold it in my hands!! It’s the first in a series of “Good Girl Guides” (Thank you Jessica Kizorek for that idea!) 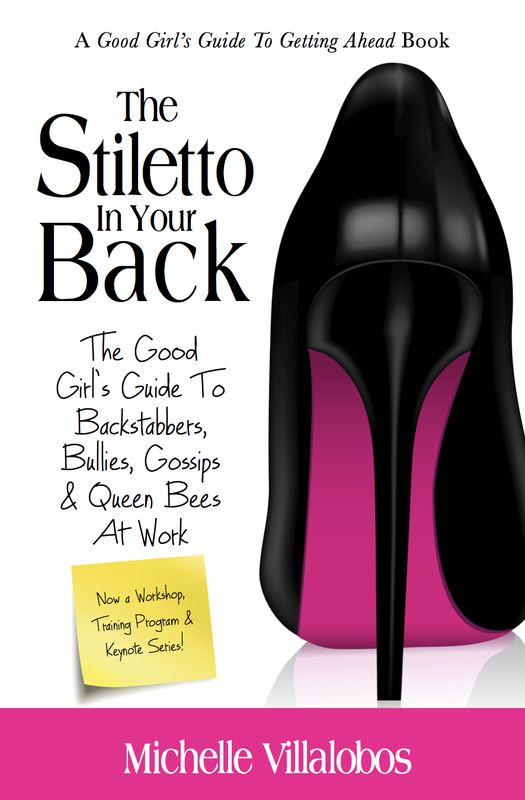 so this one is The Stiletto In Your Back: The Good Girl’s Guide To Backstabbers, Bullies, Gossips & Queen Bees, the next one is Shameless Self-Promotion: The Good Girl’s Guide To Visibility, Credibility & Marketability, and so on. Have ideas for more “Good Girl” editions? Would love to hear them!! This entry was posted in Networking Tips, Tricks & Techniques by Michelle Villalobos. Bookmark the permalink. I LOVE IT!!! I have worked primarily in female environments most of my career and it is not easy. Too much drama! I would love to get your take on how to handle this oh so potentially volatile environment. Awesome title and cover by the way.